Sorry, this is a really, really bad picture, I know. It’s a shot of a page in the Spring 2018 issue of Victoria magazine. 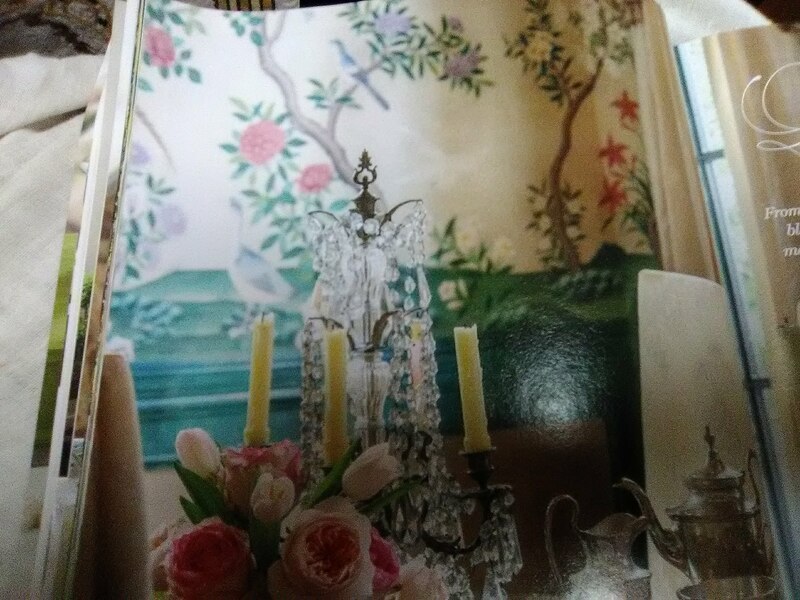 But what’s cool is that it shows a really fabulous hand-painted, custom-made, probably silk wallpaper mural, in an equally fabulous and beautifully furnished home full of antiques. The mural is by Gracie, and took a year to produce. The room has to be measured meticulously, with notes made where very door, window, bump-out, and other elements of the room are located. Then the silk is hand-painted in panels, which are then shipped to the home and reassembled sequentially as they fit around the room. Installation is tedious and exacting, and requires special liners, pastes, techniques, and sometimes even gloves, to prevent hands from touching the delicate paper and inks. This entry was posted on April 8, 2018 at 5:11 am and is filed under Uncategorized. You can follow any responses to this entry through the RSS 2.0 feed. You can leave a response, or trackback from your own site.